General Release Notes from the February 9th 2017 update. Implemented MACRA/MIPS for 2017. This includes reports for Advancing Care Information and Quality Measures, a MACRA/MIPS tab in the invoice that allows for easy tracking of patient performance, as well as the ability to attest for a patient's applicable measures. For more information about how MIPS works with TRAKnet, click here. Implemented mini-templates for MIPS documentation in the visit note. Implemented new logic behind electronic claims to comply with recent industry changes regarding the usage of treatment descriptions. Treatment descriptions now will only send on electronic claims if enabled at the insurance level, the treatment is considered Not Otherwise Classified, and there is no NDC code associated with the treatment. If those three conditions are not met, the treatment description will not be sent on the electronic claim. Resolved slowness in the scheduler related to batch patient eligibility and the refresh of the scheduler. Resolved an issue wherein superbills would not display the patient balance if there was a text frame contained within the template. Resolved an issue wherein the ActiveMedications link was being deleted from the note if any text was deleted or backspaced. Resolved an issue wherein, under certain circumstances, visit notes could not be signed. 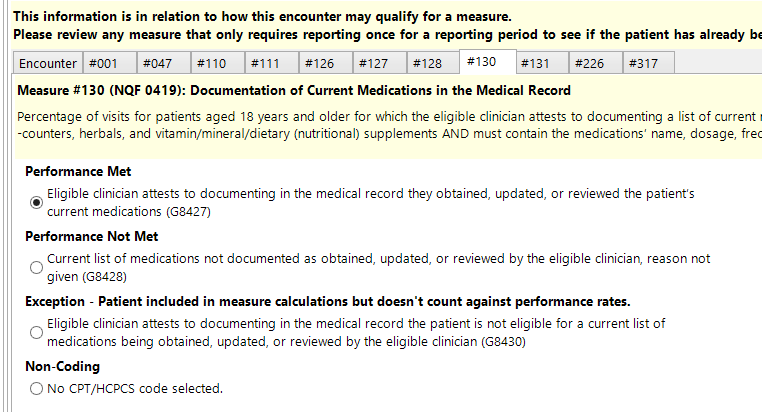 Implemented calculations for the e-Prescribing objective in the Advancing Care Information report. Please note that per CMS, there is no threshold or performance scoring for this measure, but it is required for your base score. The information/percent for this measure is for informational purposes only. 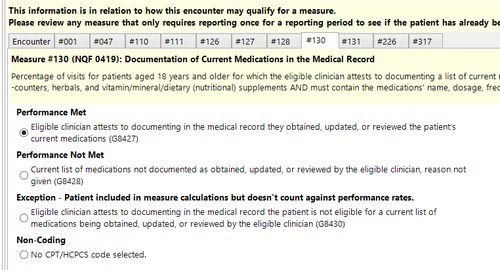 Resolved an issue wherein treatments associated with NDC codes were incorrectly excluded from sending treatment descriptions on electronic claims. Resolved an issue wherein, under certain circumstances, the GatewayEDI link in the Billing Dashboard's Claims screen was not working. Corrected verbiage on the Patient Engagement screen's actions dropdown menu. To prevent confusion, the option to send a patient an electronic CCDA now says "Send to HealthVault" instead of "Send to Portal".